In March, Mississippi banned abortions after 15 weeks of pregnancy. Not long afterwards, Louisiana Gov. John Bel Edwards was asked if he would sign a similar bill in his state, and said that if the bill made it to his desk, he would sign it. 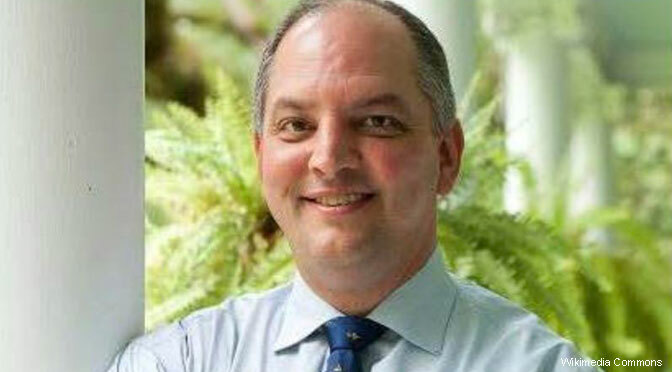 Edwards is a man of his word: on Wednesday, he signed the bill as promised, banning abortion after 15 weeks in Louisiana. The bill, introduced by Democratic Sen. John Milkovich, would impose a prison sentence of up to two years on the abortionist who commits the abortion. The new law in Louisiana is stricter than the one in Mississippi, however; it bans abortions from 15 weeks after conception. There is currently an amendment in place meant to address potential legal concerns about the bill. A judge blocked the Mississippi law, and Louisiana’s law will not take effect unless and until Mississippi’s law is held up in court. Louisiana lawmakers also requested that Louisiana Attorney General Jeff Landry file a brief in federal court in support of Mississippi’s ban. After 15 weeks, the most likely abortion procedure used is a dilation and evacuation, or D&E dismemberment abortion. This is a violent procedure that takes place over several days, and it is explained by former abortionist Dr. Anthony Levatino in the video below. The abortionist begins by inserting laminaria to dilate the mother’s cervix, which takes 24 to 48 hours. The abortionist then uses metal dilators and a speculum to widen her cervix further. He then empties the mother’s uterus of amniotic fluid before using a sopher clamp to tear the preborn baby apart, limb from torso. There is emerging evidence that preborn babies can feel pain as this is taking place. This particular method of abortion carries serious risks for the mother, including a perforated uterus or cervix, as well as damage to other organs like the bowel and bladder. There is also a higher risk of hemorrhage, as it is a second trimester abortion and the placenta is more tightly adhered to the uterus and must be forcibly removed. Gov. Edwards is one of the few pro-life Democrats in the country, and he has spoken openly about how challenging it is. He has pointed out that pro-life Democrats can be successful, but that “it’s going to be increasingly difficult to navigate these waters if the party doesn’t moderate on this issue.” He also argued that there are more pro-life Democrats than the party thinks, and they must speak up more. “[S]ometimes it’s easier for those folks who feel like we do on this issue to remain silent… but remaining silent isn’t going to get the job done,” Edwards said. Edwards has earned a 100 percent pro-life voting record, including signing a dismemberment abortion ban, defunding abortion facilities, extending waiting periods from one day to three days, and requiring physicians be board-certified or certifiable in obstetrics and gynecology or family medicine before they can commit abortions.